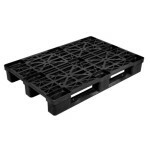 Lightweight, resistant and with non-slip surfaces, Interbox pallets are made of synthetic resin: unlike models made of wood, they are rot-proof require no fumigation. They can be forked from all four sides and can be stored in the open. 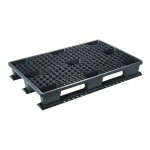 The version with runners is ideal for use with transpallets and forklift truks with rotating forks. 1) Robust. 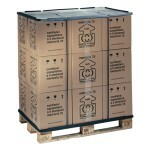 Can hold a static load up to 5.000 kg and a dynamic load of up to 2.000 kg. 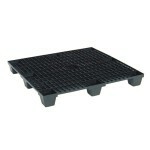 2) Resistant to damp. 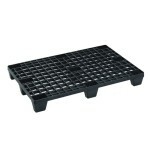 Unlike wooden pallets, Interbox S.A. pallets are resistant to water and dampness. 3) Lightweight. Light weight males all handling operations extremely practical and straightforward. 4) Costant calibration. 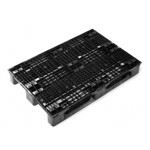 Can be used in computerised packaging systems. 5) Enviroment friendly. 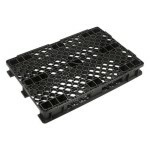 Interbox S.A. pallets are completetly recyclable and reusable. 6) Washable. Cleaning and maintenanceare very easy. 7) Suitable for foodstuffs. 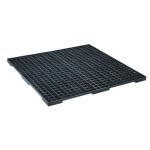 Version for use with foodstuffs are also available. 9) Immune to chemical agents. This synthetic resin is not corroded by acids and solvents.